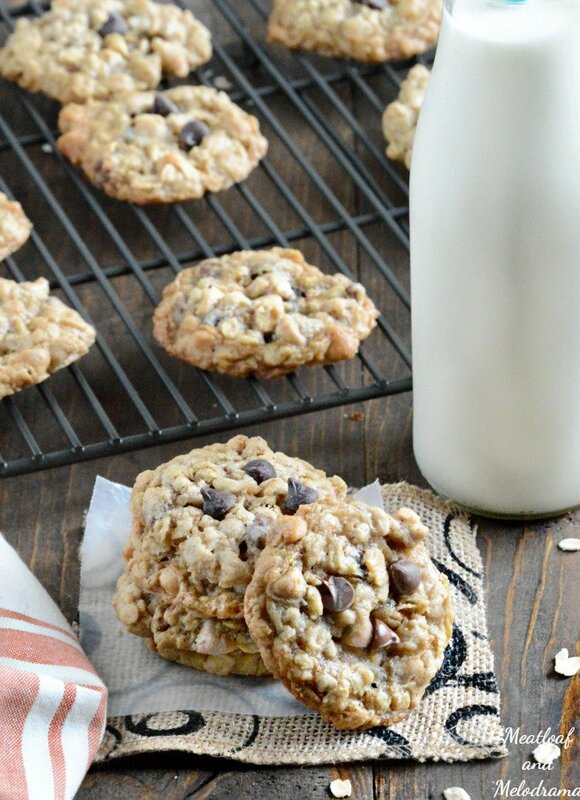 Oatmeal Butterscotch Chocolate Chip Cookies are sweet, chewy and just plain delicious. They’re like the Oatmeal Scotchies you remember, only better! 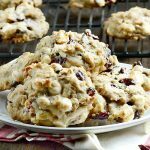 So the other day, I made a batch of oatmeal cranberry walnut cookies. They were loaded with dried cranberries as well as other goodies, only slightly sweet and actually on the healthy side. I even had one or two for breakfast. Ssshh — Don’t tell anyone, though! Anyway, after we finished that batch, the Hubs suggested that I make his all-time favorite cookies, Oatmeal Scotchies. Since today was the first day of fall, and it just happened to be a cool, rainy day, I decided to celebrate by making these oatmeal butterscotch chocolate chip cookies. This is basically the same oatmeal cookie recipe that you can find on the back of a bag of butterscotch morsels, except that I changed a few things. The Hubs grew up on Scotchies, but I’ve always loved chocolate chip cookies. So, I just had to add both butterscotch and chocolate morsels to the batter. It’s just a little compromise, right? I also added a little more cinnamon, just for extra flavor. And since I used salted butter, I reduced the amount of salt, too. 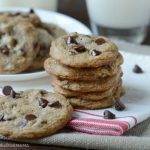 Whenever I make chocolate chip cookies, I always refrigerate the dough for a few minutes before baking, and that’s what I did with these cookies. This step is completely optional, but it seems to prevent the cookies from going flat while they bake. I also reduced the oven temperature and extended the baking time. Like I said, these are optional steps, but I like the results better this way. You could always try it both ways and see which way works better. Maybe it’s just my oven, ya know? 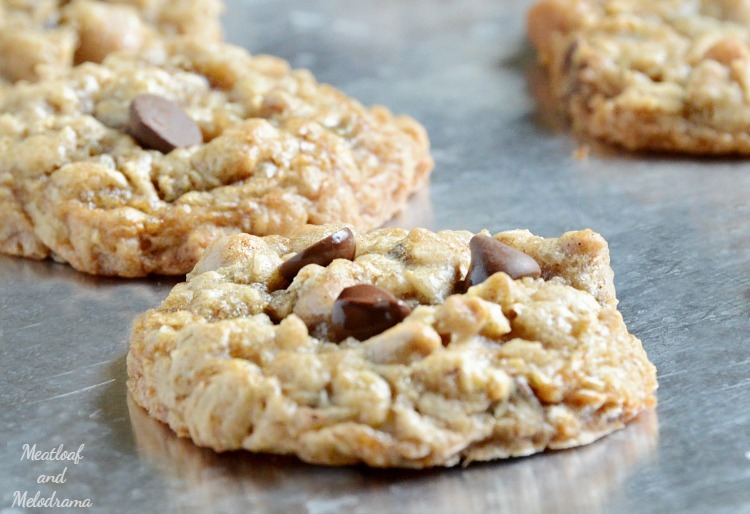 The kids loved these oatmeal butterscotch chocolate chip cookies, and so did the Hubs. After all, it was his idea! They’re soft, chewy, sweet and loaded with chocolate and butterscotch. And, they taste amazing! This recipe makes almost 40 cookies, which is a lot, even for us. So I’ll be packing extras in the kids lunches so that they can share a few with their friends. Lucky kids! My boys love oatmeal cookies. I know they would love this version. And I love that it makes lots so there will be plenty for packing in their lunches! Oh wow, these cookies look and sound amazing!! My kids would absolutely love them!! Thanks, Katerina. My kids definitely loved them! You are such a nice mom packing extra for the kids friends. They sure are lucky! These look super yummy! Cookies to celebrate the first day of fall sounds like the best plan! Loved that you added butterscotch to give them a fall flavor! yum! I just can’t get over these cookies! I’m pinning immediately — I have to try them! Yay for your husband’s recommendation! Thanks, Patricia. He had the right idea! 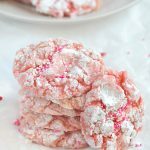 Saw your link on Happiness is Homemade Link Party – these look delicious! Pinning! Thanks so much, Roseann. I hope you like them as much as we did! There looks so delicious! I love how they have some extra “umph” to them with the oats, so I won’t feel quite so guilty for grabbing a couple for a snack! I would love to fill my cookie jar with these delicious cookies! Hope you are having a great day and thanks so much for sharing with Full Plate Thursday. Quick oats or old fashioned? You can use either in this recipe. I must be dreaming. I remember the Nestle Scotchies tube of cookie dough having chocolate chips, too. But all recipes of scotchies seem to agree it’s just butterscotch chips. So THANK YOU! I’m making these tonight. They are fabulous! Thank you for the recipe!! So glad you liked them, Andrea! 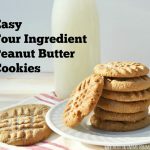 My husband remembers them with just butterscotch, but I think they taste better with both! How long would I bake these if I made them into a bar in a 9×13 pan?